This is as dark and gritty as m/m romance gets. When a rehabilitating ex-con rescues his young neighbor after a brutal attack, the result is an unlikely friendship and an angst filled attraction between the two men. I’m conflicted about this story. There were moments I loved: Jake’s family is very special. His relationship with Eric made for some very emotional scenes between the two friends. I loved Jake’s karate class and the interesting characters in the group – there are some great scenes as Max begins his training. However, as Jake and Max’s histories are revealed, this story gets darker and darker. Domestic abuse, parental rejection, poverty, bullying, and debilitating injuries are just a few of the problems circling around these two men. The resulting story was just too heavy for me. There are moments of hope and redemption, but the gloom that shadows these two had me feeling so miserable that I had to read this in small chunks. The poor communication between Jake and Max created additional conflict, but I struggled to invest in the relationship as Jake kept secrets for far too long and Max alternately chased and ran from Jake. For me, there was too much emotional angst and it didn’t ring true from two hardened blue collar men. I also struggled with Jake’s character. I couldn’t reconcile the many parts of his character. The calm, disciplined karate student who is committed to his family and his building projects seemed alien to the character described as having a brutal temper and who went to prison for assault. There is something Jekyll and Hyde about Jake’s character that just didn’t ring true for me. This is a story I might revisit when I’m in a better headspace myself. I struggled with the dark themes in this book, which isn’t necessarily criticism of the author or the writing – I just found the angst overwhelming. 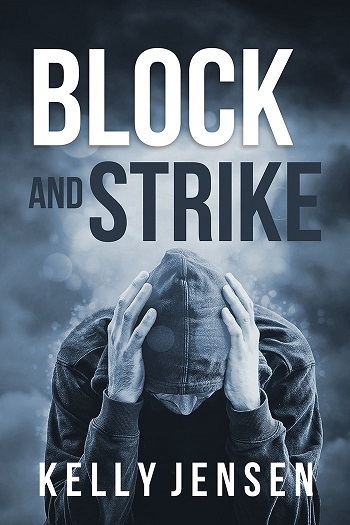 Reviewers on the Wicked Reads Review Team were provided a free copy of Block and Strike by Kelly Jensen to read and review.